Multi-Pest Indoor Fogger is a water based product that combines three insecticides to kill listed pests on contact. Non-staining - no oily residue, or unpleasant odor. Homes, attics, basements, garages, apartments, household storage areas, kennels, pet sleeping areas, non-food areas of closed barns, horse stables, greenhouses (non-commercial), seedhouses, boats, cabins and campers. One 6 oz. 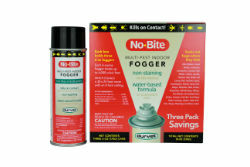 fogger can treat up to 6,000 cubic feet of unobstructed area, which equals a 30 x 25 foot room with an 8-foot ceiling. Sold in a 3 pack. STEP 1 - PREPARATION: Open cupboards, cabinets, trunks, and doors to area to be treated to allow maximum kill in all areas where insects can hide and breed. Close outside doors and windows and shut off fans and air conditioning to maximize killing power of fog. Remove pets, birds, and tightly cover or remove fish bowls and aquariums before spraying. Cover waxed wood floors and waxed furniture in the immediate area surrounding the fogger (newspaper may be used). Remove or cover exposed foods, dishes, utensils or food handling equipment. All food processing surfaces should be covered during treatment or thoroughly cleaned before using. Do not place activated fogger in a cabinet or under a counter or table. STEP 2 - ACTIVATION OF FOGGER: SHAKE WELL JUST BEFORE USING. Place a section of newspaper on floor in center of room to be treated. NOTE: Do not place fogger on water-stainable surface. Tilt can opening away from face and depress tab firmly wih thumb until it clicks in locked position. Aiming spray away from face, set fogger on newspaper, leave room and close door. After activation, leave room or house at once. Keep area closed for 2 hours (30 minutes for flying insects) before airing out. Open all doors and windows and allow to air for 30 minutes. Repeat spraying in two weeks or when necessary.